Eric L. Muller, professor at the University of North Carolina School of Law. 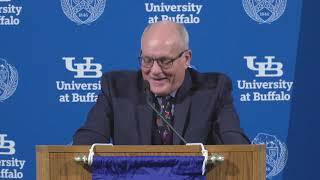 Three legal historians brought their unique perspectives to bear on a significant historical moment for the University at Buffalo and the world: a major 1946 address by U.S. Supreme Court Justice Robert H. Jackson, given at UB's centennial celebration exactly 100 years ago. Three legal historians brought their unique perspectives to bear on a significant historical moment for the University at Buffalo and the world: a major 1946 address by U.S. Supreme Court Justice Robert H. Jackson, given at UB's centennial celebration exactly 100 years ago. Jackson, who had taken a leave of absence from the high court to serve as the chief U.S. prosecutor at the Nuremberg war crimes trial in occupied Germany that followed the Nazis' surrender in World War II, spoke at UB immediately after he returned from that historic trial. Mutua identified the justice's themes as "how a warlike spirit can overcome a nation, the quest for nations to work together in the cause of peace, the interrelationship of war and oppression, and the supremacy of law over the lawless forces of war and persecution." The Mitchell Lecture presentation commemorated both the 65th anniversary of that historic speech and the 60th anniversary of the Mitchell Lecture series, the Law School's signature lecture event, which Justice Jackson also inaugurated with a lecture in 1951. Speaking first, St. John's University Professor John Q. Barrett grounded the discussion in the history of Jackson's path to Nuremberg and told how he came to deliver the Buffalo address at Kleinhans Music Hall in 1946. Barrett is writing a biography of Justice Jackson. A Western New York native, Jackson was practicing law in Chautauqua County as early as age 21 – "without a day of college education," Barrett noted – and began his political ascendance when a Democratic committeeman took him to Albany, where he met the young state senator Frank Roosevelt. Later, President Roosevelt named Jackson U.S. solicitor general, then attorney general, before his appointment to the U.S. Supreme Court. Jackson's participation in the Nuremberg trials, Barrett said, came out of reluctance, but he agreed to President Harry S. Truman's request and missed a full year of Supreme Court deliberations to complete the job. In Nuremberg, 21 individuals and six Nazi organizations were tried in a former German courthouse attached to a prison wing. The charges: conspiracy, waging aggressive war, committing war crimes and crimes against humanity. By the summer of 1946, Jackson's part in the cases against the individual defendants was complete; he returned home, then went back to Nuremberg in September for the verdicts. On Oct. 2, 1946, he returned to the United States and headed for Buffalo, at that time the 10th-largest U.S. city. Barrett's lecture was illustrated with period photographs: the county courthouse in small-town Mayville; Buffalo's Ellicott Square Building, at that time the largest office building in the world, where Jackson worked with a law firm representing a trolley company; the stately apartment house on Buffalo's West Side where Jackson and his new bride, Irene, lived. Justice Jackson, Barrett said, he "deep, close continuing ties to Buffalo to its lawyers, its bar, its bench and its great university." Those ties to UB, he said, were reflected in his argument in the 1946 speech that education "offers the last clear chance of civilization to avoid catastrophe." University of North Carolina Professor Eric L. Muller challenged the audience with a nuanced presentation in which he detailed the parallel careers of "two men who had the authority to remove and exile" persons deemed to be a threat to the state: Benno Martin, a Nazi functionary who oversaw the deportation of 4,500 Jews to concentration camps in Riga, Latvia; and Karl Bendetsen, who implemented the U.S. War Department's plan to remove all Japanese and Japanese-Americans into displacement camps in the American West. What the two men had in common, Muller said, was not zealous allegiance to ideology but career ambition. Martin, he said, had a law degree and served in the Bavarian state police, then was appointed police chief for the city of Nuremberg before accepting his assignment to round up and ship Jews to Riga. "He was not an anti-Semite," Muller said. "He frequently deployed police power to protect Jews from the most extreme degradations. He also warned some Jews in advance of police actions, and he helped some Jews to emigrate." Nevertheless, Muller said, Martin attended to the details of five deportations of Jews from the Franconia region of Germany – arranging for trains, mobilizing the police, inventorying the deportees' personal property. Bendetsen, a Stanford Law School graduate, was a fast-rising Army officer who in February 1942 was put in charge of the internal displacement of Japanese and Japanese-Americans. "The policy he was fighting for was unquestionably racial," Muller said, quoting Bendetsen as saying, "The Japanese race is an enemy race. The racial strains tending toward disloyalty are undiluted." "He threw himself into the task with dizzying energy," Muller said. And that ambition paid off: For his efforts, Bendetsen was promoted to colonel and received the Distinguished Service Medal. After the war, Martin was tried in the German domestic courts, his offenses having been deemed unworthy of trial at Nuremberg before the international tribunal. Finally his conviction was reversed on appeal, the court saying that he had ordered these deportations under duress, fearful that he himself would be sent to a concentration camp if he didn't comply. Bendetsen was named assistant secretary of the Army and was approved by the Senate for that post in February 1950, despite a protest letter from a Los Angeles priest calling him a "little Hitler." He later became CEO of a wood products company, retired a very wealthy man, and after his death in 1989 was buried in Arlington National Cemetery. "Neither of these men appears particularly extremely racist, neither stood at the pinnacle of government power; both were public servants in bureaucracies," Muller said. "And yet each set in motion the mass uprooting and physical isolation of a vulnerable population. What links the professional lives of these two men is the warping influence of bureaucratic ambition. These were two breathtakingly striving men." The final speaker, Professor Mary L. Dudziak of the University of Southern California, added context about the post-World War II world and its political situation. "The World War II generation held a set of ideas," she said. "Wartime and peacetime were more or less distinct states. Wartime was followed by peacetime. This meant that wars were by definition temporary. Rights were sometimes compromised, but since wartimes were temporary, this would eventually go away." With the advent of the Cold War, she said, "the concept of peacetime dissolved into a prolonged period of international tension and rumors of war. This is how Justice Jackson viewed the world when he delivered the inaugural Mitchell Lecture in 1951." This new reality – "a world reshaped by the advent of nuclear weapons" – was "a time of deep anxiety in American culture," Dudziak said. "It was thought that once nuclear weapons came into existence, nuclear war was inevitable." That anxiety filtered into domestic politics as well, exemplified by the red-baiting of Sen. Joseph McCarthy. The "Truman doctrine" of the 1950s framed the Cold War as an epic struggle between democratic self-governance and totalitarianism. It put forth the projection of American power as the best hope for a democratic world, rather than maintaining peace through international institutions such as the United Nations. Justice Jackson's antipathy toward totalitarianism, Dudziak said, was not only international. She cited his written opinion in a case out of West Virginia that struck down a requirement for a mandatory salute to the flag. "Struggles to enforce uniformity of sentiment have been waged by many good as well as evil men," Jackson wrote in that opinion. "Those who think they can negate dissent soon find themselves exterminating dissenters." Jackson was also wary of overreaching presidential power, concurring in the majority opinion that denied President Truman the power to seize steel mills to prevent a strike during the Korean War. He even refused to call that conflict a war, terming it "the Korean enterprise" and arguing that the constitutional power to declare war remained with Congress, not the president. "The way he described his world," Dudziak said, "Americans were troubled, disillusioned and confused. He thought about this world as similar to the world we have been occupying. We see this hovering threat to security; it's hard to define it and pin it down. We also see presidents defining the age, presidents going it alone. We don't have a check on executive power to call it a war, call in the troops and draw upon the self-generated war power." The panel was moderated by Associate Professor Tara J. Melish, director of the Buffalo Human Rights Center. The 2011 Mitchell Lecture Committee, chaired by Professor Kim Diana Connolly and co-chaired by University at Buffalo Distinguished Professor Alfred S. Konefsky, included Ilene Fleischmann, vice dean for alumni and communications, and Terrence E. McCormack, associate director of the Charles B. Sears law Library.